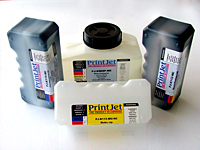 PrintJet Corporation manufactures a broad range of continuous ink jet (CIJ) inks that are cost effective replacement inks for many OEM manufacturers including VideoJet®, Domino®, Imaje®, Linx® Citronix®, and other printers. Our innovative ink technology is designed and manufactured in our on-site laboratory. This facility enables us to design and manufacture inks that meet our customers’ most complex printing needs. 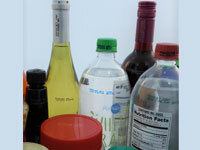 With our level of expertise, we are able to produce the highest quality CIJ inks on the market. 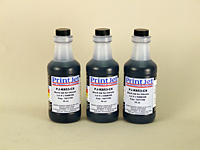 Our broad product line of general purpose dye-based continuous ink jet (CIJ) inks is suitable for most applications and is available in a vast range of solvents and colors. 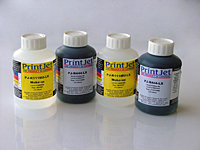 Most applications require black print on a light colored substrate, PrintJet CIJ inks are developed to be used on metal, glass, PVC, other plastics, and laminated paper. 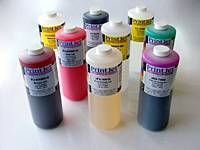 Pigmented inks are used for printing on darker substrates and are available in white, gray, silver, and light blue. Our micro-pigmented CIJ inks deliver codes in intense colors likes yellow, orange, red, and green, using a standard printer. 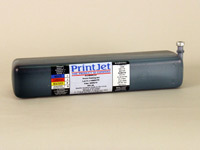 PrintJet’s continuous ink jet (CIJ) inks are the best choice for quality inks at an economical price. Please contact us today for more information. 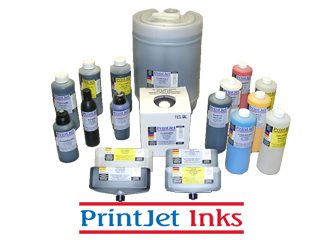 We can manufacture alternative make-up or top-off fluids for an ink. See E120 in Action Printing on Glass, Plastic, Metal and Other Materials.